I jump out of the carriage and scan the area for the driver. I find the orange Acara laying face down in the snow under the wheel of the carriage. "Oh no." Alice climbs out of the carriage after me. She watches as I pull the Acara out from under the wheel, and try to turn him over. I heave a sigh of relief when I discover he's still breathing, and seems to be in stable condition, other than the fact that he's unconscious. But I am not a doctor; I am a businessman. I need to get this man to someone who is a doctor. Unfortunately the place where we have 'crash landed' is a little off the beaten path so to speak, as far as Neopia Central goes. The snow-covered street on which the Acara is laying is lined with small, family owned business buildings — foreign grocers, specialty shops, self-employed business headquarters and the like. I know from my line of work that at this time of day one week before the Day of Giving, these types of areas are usually virtually deserted. According to my watch, it's four o'clock right now, and it seems the neopets who work here have all gone home for the night. Alice and I are the only people around, and therefore it is up to Alice and I to get this injured taxi driver to the hospital. "I'm going to try and lift him." I notify the plushie Kacheek. "If you could make sure the carriage door's open-- Actually, if you could go in there, and I could pass him through to you, that would be very helpful." The little neopet nods, and skitters away. It should be no problem at all for me to lift the slender Acara. At this moment, I'm grateful I was born a well-built Halloween Lupe. Being as gentle as a Halloween Lupe can be, I insert one arm under the Acara's shoulders and the other underneath his legs. As I predicted, our friend the driver is no trouble at all to carry. I lift him into the back of the carriage, and as promised, Alice is there to help me get him into place. When we've successfully laid him out across the benchlike backseat of the carriage, Alice looks down at the sleeping neopet with a look of genuine concern on her face. "It's all right, dear." I say softly. "He's going to be okay, I think." Alice goes over to her paper bag, which she has placed on the seat opposite the driver. She fumbles through it for a minute, and emerges with a woollen blanket of dark burgundy, and puts it over the driver. "Where did you get that from?" I say in astonishment, knowing full well where she got it from. This paper bag has now become the bag of many mysteries. 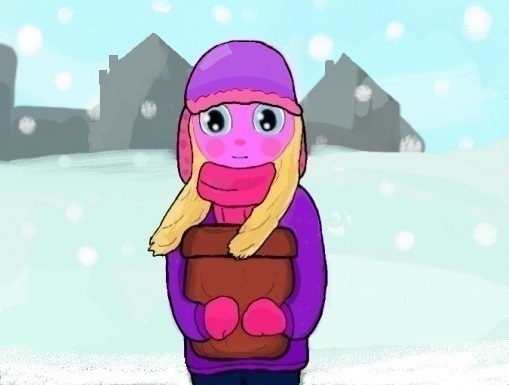 Mittens, a blanket... Maybe she's transporting means of warmth to another Neopian to ensure they're ready for the cold winter ahead. Though why wouldn't she want me to see inside? The bag must contain something a lot more personal, or valuable than the items I've seen so far. "You wouldn't happen to have any food in there, would you? Spooky Food, perhaps? I'm getting hungry." The plushie kacheek smirks wryly, and tilts her head at me. "Okay, I'm going." I say, before hopping down from the carriage. "I believe we passed the Neopian Hospital a few minutes ago, didn't we? We can take him there. Alice, will you please keep an eye on him for me?" Alice nods, and I give a quick wave before climbing up onto the stand. I'm lucky I've had experience with driving Whinnies. Of course, I've never driven these particular Whinnies. I have no idea how they'll take to a strange driver on their stand. And I still don't know what caused us to skid out of control; if it was the Whinnies who got spooked or if we simply slid on the ice... Whichever the case may have been, I will have to exercise extra caution. I start them off in a walk, and when we've been going safely at this pace for a few minutes, I pick them up into a trot. The Neopian Hospital is only a few blocks away. Driving conditions are treacherous, but hopefully we'll be able to hold out for that long. "How's he doing back there, Alice?" I call to the Kacheek in the backseat. I don't know why I do this, as I can't see any hand gesture or facial expression she might be making in reply. I guess I do it because it makes me feel better, or because it doesn't feel right not to ask. Before long we arrive at the Neopian Hospital, safe and sound. I pat each of the Whinnies on the head to express my gratitude. "Thank you." I say to the gentle beasts, and hearing me, Alice sticks her head out the window and touches her fingers to her lips, bringing her flat hand down in the direction of the Whinnies. "Alice says thank you too." I smile. I run into Emergency to alert the staff there that we have a patient to be brought in, and half a minute later two kind Neopians: a fire Grarrl and a red Vandagyre come to get the Acara onto a stretcher, and take him into the building. Alice and I go with them, but before we go Alice takes the blanket that has slipped off of our patient, and, folding it carefully, puts it back in the bag. Waiting for her, I watch her unintentionally as she does this, and Alice, presumably believing me to be spying on her, performs her task very quickly and hastily turns with a jerk. Hm, sassy are we? I laugh to myself. We sit in the Emergency waiting room for some time, waiting for word on our friend the driver's condition. The driver has been identified as one Albert Riese, a longtime taxi driver and well known citizen of Neopia Central. Mr. Riese's family is notified, and a speckled Acara whom we are introduced to as Mr. Riese's son comes to take the Whinnies home. Alice and I wait with the Rieses until a doctor comes in, and informs us of the good news that Mr. Riese has woken up, and is going to be just fine. "He has a concussion, and some mild frostbite." says the green Gelert doctor to the Rieses, Alice and I. "That was smart thinking, carrying a blanket with you on your travels. If he hadn't been kept warm, his frostbite could have been much more severe." The doctor looks at me when he says this. "The blanket was Alice's." I motion to the little girl beside me. "Well congratulations to you and Alice then." the green Gelert doctor grins. "It was very kind what you did. You both may have very well saved a man's life." We say thank you to the doctor, and wish Mr. Riese and his family the very best of luck, and soon we are out of the hospital and out in the snow again, which has now turned into quite the winter squall. It's quarter after five o'clock — less than one hour before my meeting starts, and unfortunately for me , I am now without a carriage. I suppose I'm going to have to walk to the Keatons building. If it would have been another twenty minutes by carriage, I can probably make it in forty-five by foot. I should be able to get there just on time. Who knows? Maybe I'll get lucky and stumble upon another taxi on the way. Then I recall that I gave all my neopoints to Mr. Riese for his taxi services. If I was any prudent businessman, I would have asked his family for some back. Hmph. No matter. When I close this deal with the Neopian Food Shop, I'll have enough neopoints to pay for a million taxis. Not that the money will just be going to pad my wallet, of course. It will be used to increase the standard of living for all Haunted Woods residents. It will improve the lives of thousands of Neopians, including myself. Will it not? Alice distracts me out of my reverie. She looks at me as if she's asking where I am going, although I haven't yet moved from the sidewalk. "Well dear, it looks as if I'm going to have to walk to the Keatons building. If I go right now, I should be able to get there just on time." I start to walk in the direction of the business district, and Alice grabs onto my wrist. "This is very important to me. I know it's hard for you to understand, but there's more money involved in this transaction than a child's brain could possibly fathom." Still Alice refuses to let go of my wrist. She trots along beside me as I walk. "Are you coming with me?" All of the sudden it occurs to me that although Alice knows where I am going, I never did find out where she's going. I've been so absorbed in my own affairs I didn't even stop to consider the possibility that her purpose on this journey could be equally as important as mine . "Alice, do you have an appointment to keep as well?" It seems like a very silly thing to be asking a child. "Do your parents know where you are? Do you want to go back in the hospital and neomail them?" It could be the expression on the young Kacheek's face that prompts me to ask bluntly: "Do you not have parents?" Alice shakes her head again, and starts to move her hands very quickly in signs I do not understand. I do pick up something from her flurries of movement. She seems to be speaking of another neopet; a girl. "Do you live with an older sister, perhaps?" Alice nods, and alarmingly, she starts to walk away. She looks over her shoulder at me, and then throws her head forward, smiling, as if to say 'come on'. "Wait for me!" I chase after the girl, realizing it isn't she who is coming with me, but the other way around. Suddenly out of the silence comes a piercing, shrieking noise. I turn abruptly to see a carriage, its Whinnies pulled out to the side and its wheels squealing out in front of it, and skidding out of control. It's stuck on the ice, and it's headed straight for us. "Alice, move!" I scream for the Kacheek to get out of the road. I scramble to the sidewalk, and Alice frantically tries to follow me, only to have the bag slip out from under her arms. "No!" It all happens so fast. Scenes flash before my eyes of Alice running back to pick up the bag, crouching right in the path of the carriage which is now only a few feet away. When she stands up it seems it is too late to escape. She opens her mouth to scream, but no noise comes out. Without a second to spare, or time to change my mind, I plunge into the street and push the Kacheek out of the way. Alice falls on her knees on the side of the road, barely avoiding the swerving carriage, and I stagger backwards onto the sidewalk, catching myself from landing in the dirty brown snow. The carriage skids between us, passing us so that we are now looking straight at one another from across the road. When I catch my breath, I run over to Alice, helping her off the ground. "What in Fyora's name did you do that for?" I yell. "You almost got hit! What could you possibly have in that confounded bag that could be worth risking your life for?" I must admit I'm quite surprised —shocked even — when I see tears start to run down the little girl's face. She's obviously shaken up from this terrifyingly close encounter. She's literally trembling now, and the paper bag rattles in her unsteady arms. "Well then." I sputter, unsure of what to do. "Well then." I put my arms around the quavering Kacheek, and she buries her head in my coat, never loosening her grip on the precious burden she carries. The driver of the carriage that almost killed gets control of his vehicle, and races over to us on foot. The purple Scorchio profoundly apologizes, and I tell him it's all right, sending him off with a warning that the roads are dangerously slippery, and praying that he please be careful. All the while Alice cowers in my arms. I hold her until she stops shaking, and the tears on her face start to dry. "I suppose we should get going." I say after a moment. "That bag isn't going to get to the business district itself." Alice grins, and we start to walk. The first few minutes of our trek are rather pleasant ones. I let my mouth run, in spite of myself. I've come to realize now, however, that Alice is not the kind of person you need to hold your tongue with. Though she can't speak verbally, I can tell she has very much to say in her own way, and I believe she's truly enjoying listening to the things I have to say. She even laughs at some of the stories I tell, though no audible sound comes out. It's very sad, I think, when it occurs to me that her childish laughter has never once been heard, and when she was born, her mother never got to experience the joy of hearing her newborn baby cry. It's terrible, truly, that some people are born with everything, and some people are born without even the basic necessities of life, such as a voice... I take too much for granted, I know. We pass a little cafe that looks enticingly warm inside. I'd like to take a break and stop over for some hot chocolate. But time is of the essence, and I don't have any neopoints on me. "We could go inside for a minute, just to get warm." I suggest. Alice nods, but when we approach the door to go inside, we notice the lights are off, and there's a little sign in the window that says 'closed'. I check my watch. It's going on for 5:30. "It must have closed at five o'clock." I remark. "Alice, I believe I've noticed a pattern regarding businesses in Neopia Central. Big ones stay open late the week before the Day of Giving, and small ones close early." It is a pity, really. Alice may not be tired, but I sure could use a rest, though I'm not about to admit it. Soon the snow picks up, and the winter winds decide they're no longer going to favour us. Alice and I walk along the sidewalk, though we could practically be walking on the road now, for the number of carriages have decreased to only a few scattered coaches on every second or third street. "Nobody wants to be driving in this weather." I holler over the wind. "I don't blame them." Alice puts her hand to her ear, as if to tell me she can't hear me. We soon come to a stoplight, whose bright red and green lights are barely visible through the blowing snow. On the corner of the street over which the stoplight hangs is a street sign. "Rainbow Avenue." I read out loud. "We're almost there. If I remember correctly, the business district starts at the end of this street." But with every minute that passes, the path to our destination seems to get longer, until it seems for all we've walked we'll always be a million steps away. Thoughts of Spooky Foods on Neopia Central shelves pull me forward, motivating me to keep going. It's the pot of gold at the end of the rainbow. But does the pot of gold truly exist, or is it only an illusion, an element of fantasy? Does this building I'm searching for truly exist, or am I chasing a dream I've invented myself, and achieving it will be impossible? Of course there's also the chance that the meeting has already been called off. The roads are so bad that nobody wants to drive on them, and it seems only Alice and I are crazy enough to walk. "We tried to neomail you, Mr. Stoke," I can almost hear a voice saying. "But there was no one at your hotel room to get it." In that brief second while I'm looking at Alice, her knees give out under her very light weight and she drops suddenly in the snow. "Alice!" I run back to pick her up. I don't know if she slipped, or collapsed from exhaustion. Then I realize I never asked her if she had been hurt from the carriage incident. "I'm so sorry, Alice! Are you all right? Are you hurt?" The Kacheek shakes her head. I admit she didn't seem in the least bit injured before, but now she seems utterly exhausted. I try to take the bag from her, but she quickly turns away. "Alice, I'm just trying to help you." I plead with her. "I'm not gonna look inside! Just let me carry it for you!" Alice continues to shake her head. I don't want to fight with her, but the giant bag is weighing her down. She's no longer walking as fast as she was before, in fact, she seems feverish and looks as though she could collapse again at any moment. I can already feel the frostbite on my hands and the tips of my ears, and Alice is now covered in snow from her fall. I'm sure we're both going to have neomonia when all of this is done. We need to get out of this storm, but every building we pass is closed and locked and there's nowhere for us to go. Still, I don't take the bag from the little Kacheek. Instead I take her hand, and drag her along behind me. When at last I open my eyes, the world seems brighter than it was before. The snow has slowed considerably, and it's as if we've walked out from under a heavy snow cloud, and into a whole 'nother world. Through the silver clouds, a crescent moon shines above us, and the harsh wind that blew is now but a brisk winter breeze. Large, round snowflakes fall from the sky, landing softly on our heads, versus spraying in our faces. It's almost as if magic is at work here. "It's incredible." I breathe, and Alice grins from ear to ear. Though this area of town is hardly bustling, there are a few scattered neopets around, riding in carriages or rushing in and out of buildings. It's refreshing to see other people again. During the storm it seemed it was only Alice and I. A small gathering of men and women have assembled down the street. "I wonder what's going on over there." I say to Alice. "Let's go see." The crowd of Neopians are all heading up the stairs of a single building. I look up to the grey stone block, and read the address above the door: 1254 Sandway Street — The Keatons Building. It's five minutes to six o'clock, according to the watch on my wrist. After all we've been through, it looks like I've arrived just on time. "I must go into my meeting now." I say to my young companion. "But Alice, what are you going to do?" I gasp when I realize the little girl is not beside me. "Alice?" I look around desperately for the Kacheek. I find her walking up to the building, but when she gets to the great staircase, she does not go up the stairs, but walks beside them into an alleyway between the Keatons building and its neighbour. "Alice, where are you going?" I start to follow her into the dark alley, which is lit only by a single streetlight at the entrance between the two buildings. I watch Alice's retreating back for a moment. Then, all at once, another little girl — a yellow Usul perhaps half the age of Alice — steps out from the shadows. The girl is followed by another girl, this time a blue Kyrii, and after her come two boys, red Shoyrus who are followed by a tiny neopet whom, from what I can see, is a spotted Korbat. Alice kneels down in front of these five young neopets and holds out her brown paper bag. When all of them are obviously too shy to take it, Alice starts to open it herself. She unwraps the bag, and emerges with her first item: a wooden toy — a Warf on wheels. She then removes four more toys similar to this one, all of them old and well-loved, but still in decent working condition. The Kacheek proceeds to remove some used clothing: four large sweaters, a handful of long-sleeved t-shirts, a few folded pairs of pants and a small winter coat, with a matching scarf and the mittens I saw earlier. At the bottom of the bag are two woollen blankets, a blue one with some sort of petpet design on it, and the burgundy one Alice had put over Mr. Riese. This bag had clearly contained some of Alice's most cherished possessions. It's purely heartbreaking, I think to myself, that a child like Alice had to be born mute. It seems more often than not people who have the best things to say are incapable of conveying their words, for some reason or another. When Alice is done unloading the bag, she stands up, and all the little neopets gather around her. Alice and the children join hands, and begin to dance in a circle around the pile of donated gifts. They're singing a song, a Christmas carol, and I feel my eyes begin to fill with tears. This was what Alice was trying to protect this whole time. Some Day of Giving presents for a group of homeless children, who, undoubtedly will not be getting any other gifts this year. The bag was precious cargo. Very precious indeed. The alarm on my watch goes off, telling me it's six o'clock. I should go into my meeting now, but will Alice be here when I get back? I'd like to ask her this, but that would entail me breaking up another meeting, one far more important. I wave to the Kacheek to tell her I'm leaving, and she looks over her shoulder at me, then throws her head back into the circle, signing for me to come over. "Alice, I can't. I've come all this way to--" I stop myself. What am I doing? I've come all this way to accomplish something truly important. If, and only if, I am successful with this appointment, what exactly am I going to accomplish? I'm going to make a lot of neopoints, that's for certain. But will that money make me, or anyone as happy as these five destitute children, dancing around the worn-out clothes and rickety wooden toys they've just received from another poor child? I run toward Alice and her friends and join in the celebration, holding hands with she and the yellow Usul as we whirl about in the circle. The owners of the Neopian Food Shop will just have to wait for me. Because a bag full of this much love and purpose is worth so much more than a bag of gold.